What I like about this dish is how easy it is to put together on the spot or in advance and how pressuring cooking really makes the beef so succulent. I've included directions for freezer meal instructions and how to cook from both defrosted and frozen states - both of which the Instamt Pot can handle with no problems. The best thing is the longer you cook, the better it gets. Leftovers are especially awesome over a heaping mound of buttery mashed potatoes! Plug in the IP and add chuck roast, garclic, rosemary, bay leaves, soy sauce, beef broth, and water. Once at pressure, the display will reflect 30 (the number of minutes you initially set) and will begin to countdown to 0 minutes. When the IP beeps after pressure cooking for 30 minutes, allow your IP to naturally release pressure for 20 minutes. While naturally releasing pressure (also known as NRP or NR), the display will reflect numbers counting up from 1. The numbers indicate how many minutes the IP has stopped cooking since it beeped (or how many minutes it has been naturally releasing pressure). No need to touch your IP while it naturally releases pressure. When the display reflects 20 (which is 20 minutes since the IP has beeped), turn the setting on top of your IP to VENTING. Doing so allows the IP to quickly release pressure (also known as QRP or QR). I use a wooden spoon to carefully turn the setting to avoid close contact with the potential steam. You may also want to turn your IP away from cabinets to allow the released steam to escape freely. The pin at the top of your IP will drop when all pressure has been released and it's safe to open. Open up your IP when the pin has dropped (allow a few minutes for this to happen). Shred the roast using forks or tongs. 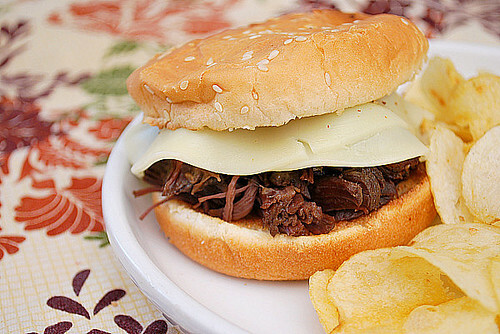 To serve, place in hamburger buns or split french bread and top with your preferred cheese if desired. Feel free to dip your sandwich in the au jus left in the IP too! - To cook from frozen, place contents into your IP and add broth, water and soy sauce. Cook for 45 minutes under pressure and naturally release pressure for 20 minutes before quickly releasing pressure. - To cook after defrosting completely. place contents into your IP and add broth, water and soy sauce. Cook in IP as directed above.